TED.com offers great English listening practice, with over 1,000 interesting, clear talks on many subjects. However, most are best for intermediate or advanced English learners. This page links to 7 TED talks easy enough for A2 (high beginner) English students, with questions to help you focus your listening and to discuss or write about your responses. For the first three talks, there is a brief introduction and some comprehension questions to answer after the first and second time you listen to each talk. (Listen at least twice—more often is O.K. because you will understand more details each time.) The talk will open in a second window so you can go back and forth between talk and questions. Pause each talk whenever you need to (and later read the transcript, if you like.) The talks are long—10 to 19 minutes—but tell very interesting stories. 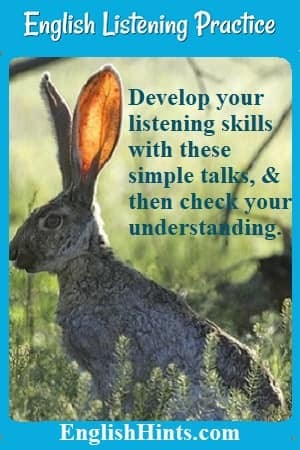 Concentrate on understanding the stories and the speaker’s main idea the first time you listen. Check your understanding, and try to answer the questions, the second time around. If you are interested in the other talks, there are also some questions to think about. You can practice your English writing (or speaking) skills by trying to answer one or two of them. All of these talks are related. They are about hope: about people caring for each other, overcoming violence, and helping others reach their full potential. You can start with any of them by clicking the links in the list below. These questions are also available in pdf form for teachers. See the Beginning Lesson Plans section of ESL Lesson Plans. How do you react to difficulty and failure? Are you willing to work harder with the hope of doing better? Does it help? Can you change that ‘C’ into an ‘A’ if you keep studying? Did you know that trying something difficult for you can actually make new connections in your brain? In this 11 minute talk, Carol Dweck, an education researcher, illustrates the power of believing that you can improve. She shows that those who believe abilities are fixed (a person is either good at something or not, smart or not) make very different choices than those who believe they can get better with effort and practice. A. we can develop our abilities and intelligence; they are not set forever at a certain level. B. our abilities can grow a certainf amount but are mostly fixed at birth. C. our bodies and minds grow until we become adults. D. we need to grow up and act like responsible adults. A. that test wasn’t really important. B. it’s O.K. to fail. C. some people just aren’t good at taking tests. D. they can keep studying and pass it next time. A. believe if they failed at something they would never be good at it. B. believe if they failed at something or made many errors they needed to practice it more. D. look for others who did worse than they did so they could at least feel superior to them. A. students were disappointed they didn’t immediately feel smarter. B. students decided studying was too much work. C. students were more willing to keep trying, and their grades went up. Bonus question to think about, write about or discuss with someone: Dweck suggests that we can help children develop a growth mindset by praising their effort and improvement rather than their talents or intelligence (which they may feel they can’t change.) How important do you think this is? Have you heard of the Taliban, a rebel group in Afghanistan? What do you know about them? The Taliban do not like many things about western culture, but they especially dislike education for girls and women. Sakena Yacoobi: How I stopped the Taliban from shutting down my school. 17 min. Sakena Yacoobi’s father sent her to the U.S. so she could become a doctor and help save lives. After Russia invaded Afghanistan, her family became refugees, and she was able to bring them to safety in the U.S. However, her heart was still in Afghanistan, and she went back to see what she could do to help. Listen to her story and think about what she decided was the best thing to help her people. 1. While visiting in the refugee camps, what did the speaker decide was the best way she could help in Afghanistan, and why? A. As a doctor, she could care for maternal and child health and save lives. B. As a doctor, she could help people who had been wounded during the fighting. C. By opening schools for girls she could give her people confidence and a way to support their families and move forward. D. By opening schools for girls she could distract them from their worries and help them become better wives. 2. Once 19 young men with rifles stopped Sakena Yacoobi’s car. What did they want? A. They wanted to kill her because she was educating girls. B. They wanted her to stop educating girls. C. They wanted her to pay them a lot of money. D. They wanted her to educate them too. 3. What did she do about it? A. After they let her go she never went back there again. B. With the help of donors she started classes for young men too. C. When she left she called for military help. D. She gave each of them money to go to school. 4. What has happened to those young men since then? A. They have attacked other educators. B. They got educated and have become her supporters and protectors. C. They have joined the Taliban. D. They have grown up and started businesses. Bonus question to think about, write about or discuss with someone: Do you agree with Sakena Yacoobi about the value of education to completely change people’s attitudes and lives? Explain why or why not, discussing the types of change education can or cannot cause. What do you know about the International Red Cross? What are some of the services they provide? What services do you think are so important that they need to operate even in a war zone with active fighting? Alberto Cairo worked for the Red Cross as a physical therapist providing prostheses (artificial arms or legs) for Afghans disabled by the war. At first, the factory closed whenever the war got too close. Something changed that. Listen to the story the first time to find out why they changed that policy. What made them decide that keeping their rehabilitation center open was a priority, even in the war zone? 1. What made the Red Cross decide that helping disabled people was a priority, even when there was fighting nearby? A. The government started to provide protection to the Red Cross. B. They got more donations. C. They saw the risks disabled people were willing to take to get help. D. They didn’t have any other work to do. A. a chance to work to support themselves. C. protection from the war. D. help for their families. 3. Why did the factory making prostheses—artificial limbs—start practicing “positive discrimination,” hiring disabled people whenever possible? A. They learned that even people with major disabilities could manage to do their jobs well. B. They didn’t have to pay as much to disabled people. C. Seeing that other disabled people could work was a source of hope to the people who came to get prostheses. Cairo said he didn’t feel Mahmoud could keep up with the work of making prostheses with only one real arm and no legs, but they found Mahmoud even speeded up production, because he wanted to prove himself able to work. Have you ever had an experience in which someone questioned your ability and you worked exceptionally hard to prove you could do it? If not, do you know someone else who has proved himself (or herself) in spite of great difficulties? I found each of these talks outstanding. Listen to them, looking for answers to the questions connected with each talk. (These are not easy questions to answer in English, but think about them.) Then listen again, or read the transcript to deepen your understanding of their stories and build English vocabulary and fluency. 1. Joseph Kim: The family I lost in North Korea and the family I gained. (Have you ever had to leave people you loved without knowing when you would see them again?) 14 min. 2. Elizabeth Lindsey: Curating humanity's heritage (What does Lindsey want to preserve? What does she fear will be lost to humanity? What does she mean when she says this planet is our canoe and that we must work together?) 10 min. 3. Scilla Elworthy: Fighting with nonviolence. (Elworthy says it is often more effective to fight bullying and violence with nonviolence. Can you give an example? What skills can help? )* 16 min. 4. 9-11 Healing: the mothers who found forgiveness and friendship. (What brought these mothers together and helped them understand each other in spite of language and cultural differences?) 9.5 min. * #3 See her example of American bombings of terrorist targets increasing terrorist numbers. Skills include self-understanding, dealing with fear and controlling anger—using it as a fuel. You can find TED talks for all levels, ranked by level and speed and with English listening practice exercises, at Lingorank. You can also find many simple (A1-B2 or so) conversations at Randall’s ESL Listening Lab. For more listening practice (including TED talks) at various levels see also Listening and Reading Comprehension Exercises. Home> Listening & Reading Comprehension Exercises> A2 English Listening Practice Using TED Talks.